At least partially. Obtained early in the game, this item allows you to "glitch" enemies and tiles, applying slowdown, flicker, corruption, and other effects to your advantage. 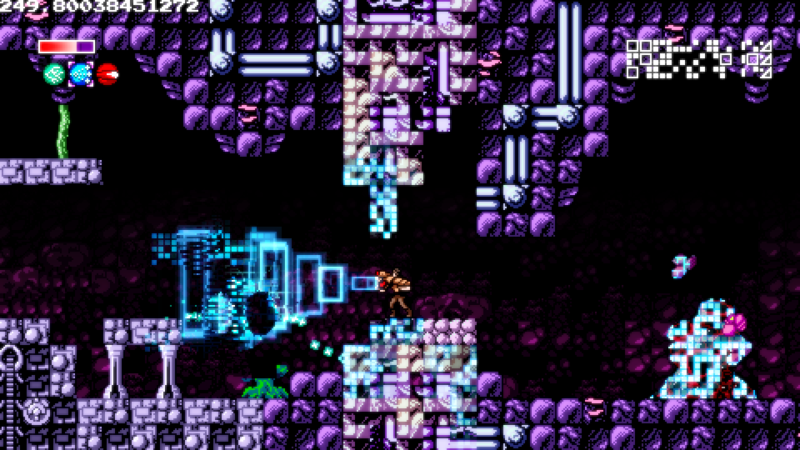 In the image above you can see a bunch of tiles that were glitched so that you can drill through them, and some enemies that have been glitched to slow them down. There's more, though. The ray is just the beginning - the first of several abilities related to game breakage. Think of all the things you did in NES games that the designers didn't want you to? Yeah, those things. Although I'd had these features planned long before I made this site (like, over a year), I didn't want to mention it until I had some proof to back it up with. So I let on that this was a game about collecting weapons. Oops.